What is a permanent solution for black mold? Mold-removing chemical products are good but the mold keeps growing back. What is an efficient permanent solution? Removing the cause of the problem rather than the problem itself is the only real solution to permanently remove mould . Don't add moisture unnecessarily, e.g. use an extractor fan if cooking or showering generates a lot of steam. If the moisture is coming through the walls, floor or ceiling, the problem is much more difficult and will probably require a professional damp proofing course. You will also need to remove the mould completely to reduce the chance of spores multiplying again. The chemical sprays you use already are probably enough for this. Black mold is caused by Stachybotrys (also known as "toxic black mold" in the US( and it's usually associated with poor indoor air quality that arises after fungal growth on water-damaged building materials and exposure can cause adverse health effects. 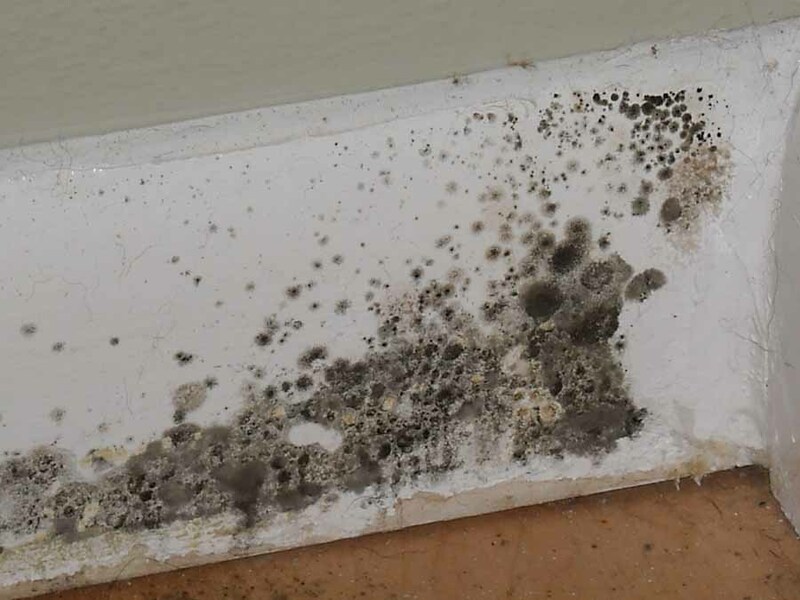 The worst-case scenario for homeowners is produced by consecutive episodes of water damage that promote fungal growth and mycotoxin synthesis, followed by drier conditions that facilitate the liberation of spores and hyphal fragments2003. Remember that simply killing the mold with a biocide is not enough. It can grow on any substance (on wood, paper, carpet, and foods) and there is no practical way to eliminate all mold and mold spores in the indoor environment. The way to control indoor mold growth is to control moisture. Assess the area infected with mold, checking for any hidden mold. Identify and permanently fix the source of the leaks or seepage (such as water problem) to prevent mold growth. Water leaks in pipes, around tubs and sinks and can provide a place for biological pollutants to grow. Clean and dry any damp or wet building materials and furnishings. Clean all components of the HVAC system to ensure nothing becomes contaminated. Remove any object/materials near the insulation system that may have been contaminated. Reduce indoor humidity (to 30-60%) to decrease mold growth. Use dehumidifiers and air conditioners (be sure that the appliances themselves don't become sources of biological pollutants). Reduce the potential for condensation on cold surfaces on cold surfaces. Be sure crawlspaces are well-ventilated. Turn off certain appliances (such as humidifiers, kerosene heaters) if you notice moisture on windows and other surfaces. Or remove/dispose contaminated HVAC filter media. Raise the temperature of cold surfaces where moisture condenses. Use exhaust fans (e.g. in bathrooms and kitchens) to remove moisture to the outside. Move furniture from wall corners to promote air and heat circulation. Keep open doors between rooms (especially to closets which are colder than other rooms) to increase circulation. In areas where there is a perpetual moisture problem, do not install carpeting. It can absorb moisture and serve as a place for biological pollutants to grow. If you have insulated air ducts and the insulation gets wet or moldy, it should be removed and replaced. Consider replacing the insulation in the HVAC system with an external to prevent future floodwater contamination. If above conditions causing the mold growth are not corrected, mold growth could recur. In case where the area of mold is large you should hire a remediation manager to properly dispose of the mold or consult with a qualified professional. Depending on the environment this is happening in (pets, children, food preparation, ...) this permanent solution might not apply. A bit of back-ground: Mould is one of the oldest life forms on Earth and thus pretty resistant to pretty much everything... You can temporarily stop growth, but even bleach, ammonia, ... are no permanent solutions. The solution: Before attempting any of the following remedies, you need rubber boots, chemical gloves and a gas-mask. Peroxide: The Marilyn Monroe of the solutions, but not the normal pharmacy 2%, but the nasty 30 or 40% industrial-strength product. It works by releasing ionic oxygen, so the gas-mask might seem superfluous but is really needed as it'll burn your lungs. 30-40% Peroxide also stings like hell if even a tiny drop gets on your skin and feels like someone is poking you with a needle for an hour or so (though no permanent damage will be done, happened quite a few times to myself). Sulphuric acid: The vitriolic of the solutions, just not the normal battery acid (5%), but real vitriol that is hygroscopic and will not only liquefy any deep spores, but pull out microscopic amounts of water from the cracks that contain the mycelia. No need to describe what vitriol does to your skin: a mummy will look fresh compared to a skin that gets even a tiny drop on it! Use a high-quality synthetic sponge and please don't apply this on wood, calcium-containing stone (bluestone, sandstone, calcite), metal or similar materials (bricks, cement, concrete are no problem). You'll notice a bit of heat as you apply the vitriol; this is due to the hygroscopic effect and is absolutely normal. Again: don't just clean the moulded area, but as much around it as well to kill off the spores as with solution #1. Potassium Cyanide: This is the kill-all of cleaning products! Containing a triple Carbon-Nitrogen bond it breaks open any mould DNA down to the molecular level and leaves behind the most sterile and clean area you've ever witnessed. Just add it to water (even a 2% solution will work great!) and again use a sponge (synthetic or natural: now it doesn't matter) and the same physical treatment as the above solutions. This is the most permanent solution of all! Whichever of the solutions you took, it's important to let the entire room dry (adding an air conditioner set to dehumidification mode is an asset) as mould needs water (even in microscopic quantities) to flourish! Final warning: If you would want to apply all of the above, please allow sufficient time between applications as mixing the vitriol with the Potassium Cyanide will generate Hydrogen Cyanide: a gas smelling of nice raw almonds that kills any oxygen-breathing life-form on Earth within seconds! And finally: apply another coat of water-resistant paint to the surfaces thus treated! I have the same problem and I have tried with white vinegar and after several months bleach spray for mold removing (which is not exactly a lifehack but works). The spray works better for me, but smells bad and it is very toxic. If the moisture comes from the wall first you have to make proper isolation. If the moisture comes from the air then you have to reduce air humidity (ventilation, electric dehumidifier). Find the source of humidity and remove it. Sources of humidity can be household activities such as cooking, washing; big plants; water leakage due to plumbing problem somewhere in the house. You have not said where this mould is or what the conditions are. So here is just a helpful guess. Firstly, the mould spores are always there, you can't get rid of them forever, so you have to stop them from flourishing. Most of all you have to get it dry. Ventilate! Move your furniture and stuff an inch (25 mm) away from the wall. Dry the spot by using heat. Of course this may spread the spores around the place, wash them off first. Make sure your problem areas are always well ventilated. If this is a bedroom then get used to sleeping with an open window. -Using a dehumidifier is a good short-term solution, but uses a lot of electricity. -Never ventilate on a warm day when outside is warmer than in. Otherwise warm, moisture-laden air comes in and the water condenses on your cool areas. That's the first step. Now we have to stop moisture from collecting in corners and similar spots. It does this where one spot is colder than the others. If the house belongs to you then insulate it on the outside. Otherwise talk to your landlord about it. Often cold spots are above window frames because the house structure has design faults. You might like to insulate on the inside, though that's not the optimal solution. So your answer is to ventilate and insulate. edit: a new point I thought of. You can paint the problem area with fungus-preventing paint. I got some of this for the north side of my garage and it works very well. However, this is probably not suitable for indoors - but you could ask in the paint shop. Many mold killing products contain chemicals. These chemicals can be allergenic, bad for the environment, and bad for your family and pets. Vinegar, on the other hand, is a natural acid. Vinegar is totally non-toxic and safe of course. You can drink it, afterall. Vinegar is also biodegradable and fine for the environment. Although vinegar leaves a strong smell, the fumes are not harmful at all. It is very cheap to buy vinegar. You can easily find bottles of white vinegar in the supermarket. We had black mould spores growing on our basement walls because we had a water leak behind the wall that we were not aware of. Once we got the water leak fixed we were left with the job of getting rid of the black mould spores on our wall. We found a fantastic mould spray that completely got rid of all the black mould spores and they haven't come back since. Not the answer you're looking for? Browse other questions tagged home cleaning or ask your own question. How to reduce the air humidity in a room? Permanent marker on a dry erase board? How to dust Venetian blinds? Is there a non-mechanical solution to unclogging a sink drain? How to remove mold from suit?